Hooray for Hump Day because once again it is Woman Crush Wednesday. This week the 68th gorgeous gourmet gal is getting the love. And of course we get another fab recipe. Since today’s prolific WCW has written ten cookery books it should be easy to find one! 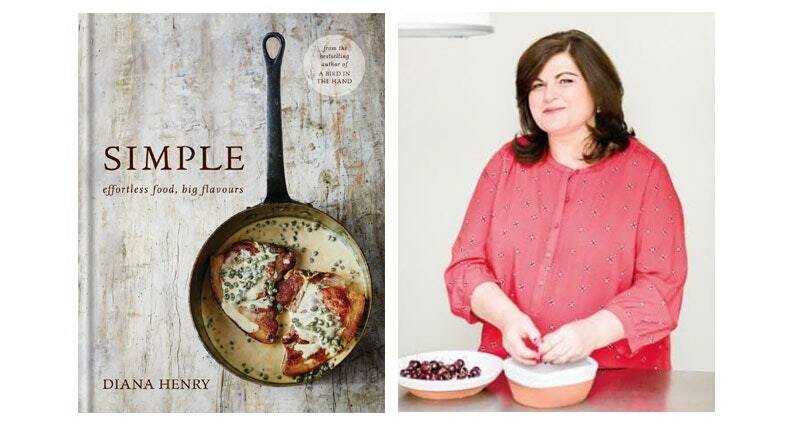 Diana Henry is a most incredible chef, broadcaster and award winning food writer. 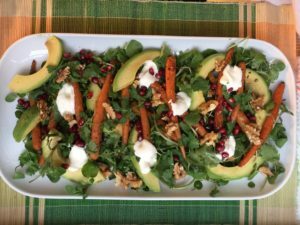 But since I’ve been in a salad mode lately, and it is still warm here in London, I think we will have a healthy dinner tonight! Thanks to Diana Henry, this won’t be an ordinary salad. Her knowledge of ingredients, textures and flavors means it will be amazing. 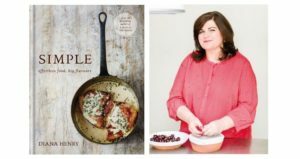 Though she grew up cooking at home in Northern Ireland, she ended up training at the famous Leith’s Cookery School here in London. Not only is Diana a James Beard winner for her book “A Bird in the Hand”, she writes for many publications such as the Sunday Telegraph and BBC Good Food magazine. This recipe is from her most recent book called “Simple“. Trim the carrots at the tops but leave a bit of green tuft on. 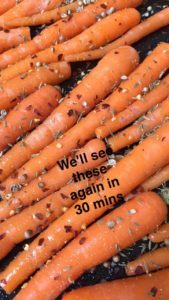 If you can’t find slim carrots, halve or quarter large ones. Don’t peel them, just wash well. Put in a roasting tin in which they can lie in a single layer. Add the olive oil, spices and seasoning. Turn the carrots over in this to ensure they are all well coated. Roast in the oven for about 30 minutes; they will become tender and shrink slightly. Be careful not to overcook them. To make the dressing, just whisk everything together with a fork. Halve and pit the avocados, cut into slices, then carefully peel each slice. Put everything except the yogurt, garlic and pomegranates into a broad shallow bowl (or onto a platter) and gently toss in three-quarters of the dressing. 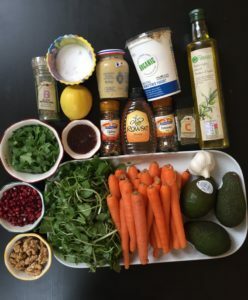 Mix the yogurt with the garlic and dot spoonfuls of this among the vegetables, then scatter with the pomegranate seeds. Spoon on the rest of the dressing and serve. Wow this salad is loaded with flavors! I’ve had roasted carrots before but not like this. The spices really add a whole other dimension to the usual sweet, earthy caramelized roasted carrots. I loved that hit of chilli too. And the cooling aspect of the yogurt along with the crunch of the walnuts and tangy pomegranate seeds is sublime. This is like the perfect salad. No, not like the perfect salad, it is the perfect salad. But I am sure all of Diana’s salads or any of her recipes would be perfect! 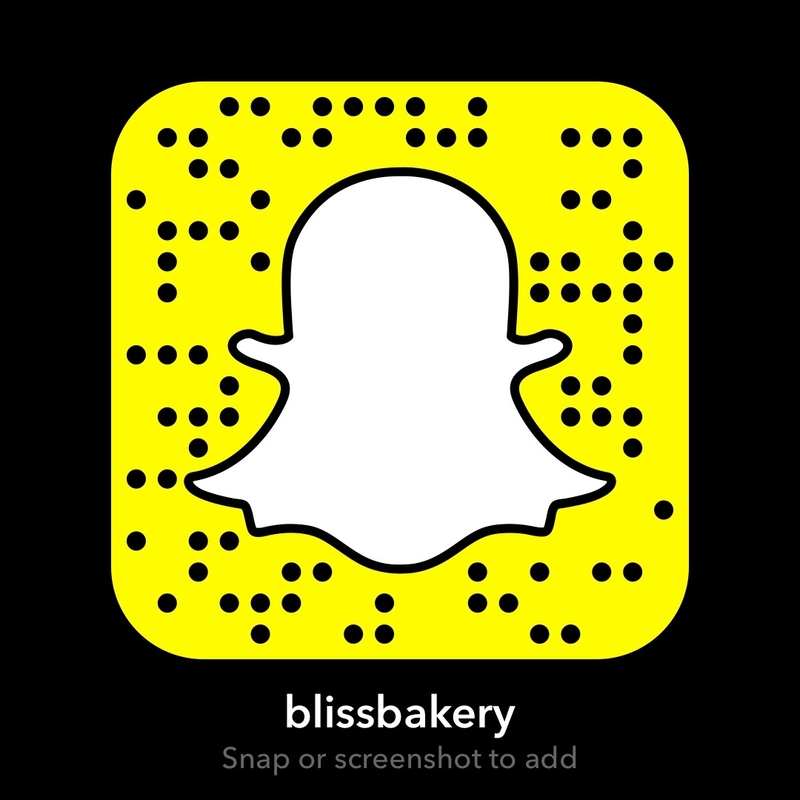 I did my weekly Woman Crush Wednesday cooking tutorial live on Snapchat (username blissbakery) so come check it out while it is still up for the 24 hours. 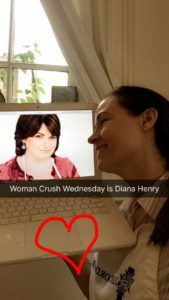 And if you haven’t met Diana Henry yet, I encourage you to do so. 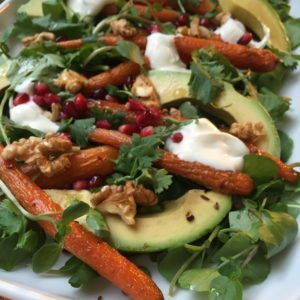 Her social media channels are worth following as she shares gorgeous food photos and links to some of her outstanding foodie journalistic pieces. Check her out at Instagram and Twitter and let me know if you’re as big a fan as I am! 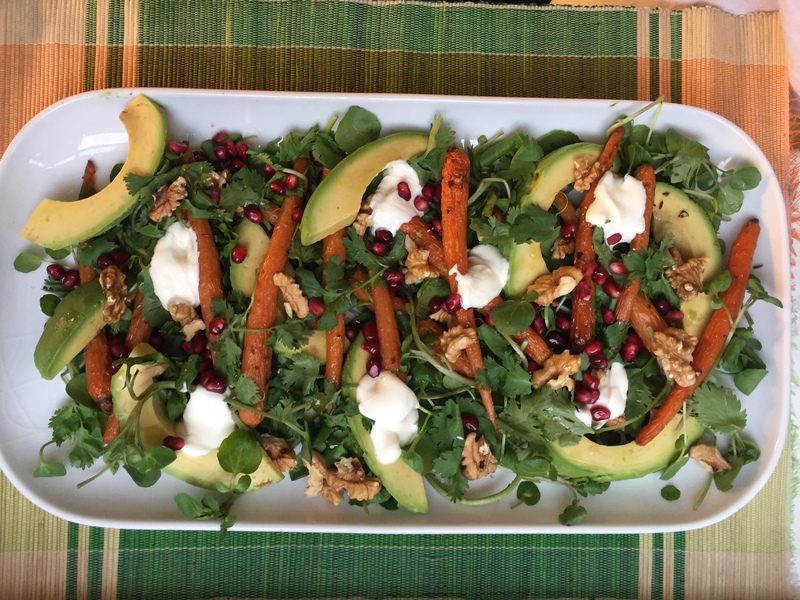 So while I continue to savor this amazingly filling (yet non guilty) salad, I hope you enjoy the plethora of recipes Diana Henry shares with the world. And looking forward to meeting you back here again soon!